A historian and armchair archaeologist shares her knowledge of Florence. Most travel guides do not open with definitions of Stendhal syndrome and humanism, but this unusual introduction sets the tone for the debut book. As delineated in the subtitle, the work focuses on Florence’s “Gems” (noteworthy places) and “Giants” (diverse luminaries). Before these two main sections, there is a checklist of things to do and see in the city, presented in the form of provocative questions (for example, “Who broke Dante’s heart?”), followed by textual and image tables of contents and a background section. The last includes a map of Florence and a brief overview of its history and development, beginning with the plague in the 1300s and continuing through the Renaissance (1500s). The “Giants” section is the lengthiest and provides biographies of the Medicis, Petrarch, Botticelli, Leonardo da Vinci, and other well-known figures associated with Florence but also lesser lights like Masaccio and Ghirlandaio. 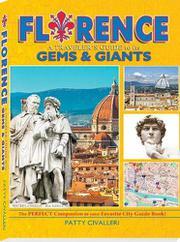 The relatively shorter “Gems” presents tidbits on some prominent tourist sites, including the Uffizi Gallery and Ponte Vecchio. The final section, “Wandering Around Today’s Florence,” gives a list of piazzas and offers tips on the best views, art, and day trips. While readers looking for information on hotels and restaurants will be disappointed, Civalleri gives more in-depth information on the history and significance of Florence’s celebrities and sites than traditional guides. Despite the reams of history, the work is still a light, entertaining read. The extensive use of illustrations—primarily photographs, but also maps—enlivens the text. Numerous sidebars supply anecdotes, definitions, and brief topics. The various font styles, sizes, and colors keep the book visually intriguing (although it occasionally verges on becoming a little busy). Ultimately, Civalleri delivers on her promise to teach readers about Florence through its fun stories. While this work looks like a traditional Florence guidebook, the author’s expert use of facts and illustrations sets it above the rest.